I'm a big fan of baked eye shadows and blushes. I had read a lot about Milani Baked Metallic Eyeshadows but never got chance to try them out but this time I got this chance and I'm very happy after using it. 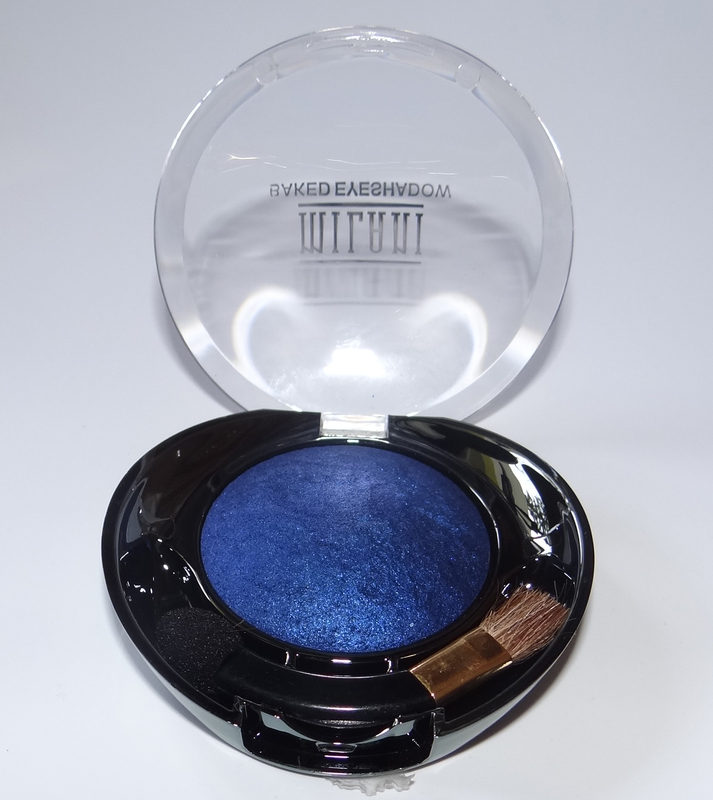 Milani Baked Metallic Eyeshadow Blue My Mind is medium-dark navy blue baked shadow with a shimmery, metallic finish. Milani’s Baked Metallic Eyeshadows can be used wet or dry. Talc, Calcium Aluminum Borosilicate, Dimethicone, Octyldodecyl Stearoyl Stearate, Silica, Synthetic Fluorphlogopite, Polysorbate 20, Magnesium Aluminum Silicate, Phenoxyethanol, Sodium Dehydroacetate, Tocopheryl Acetate, Acrylamide/Sodium Acryloyldimethyltaurate Copolymer, Cetearyl Ethylhexanoate, Sorbitan Stearate, Ethylhexyl Methoxycinnamate, Simmondsia Chinensis (Jojoba) Seed Oil, Zea Mays (Corn) Starch, Isohexadecane, Polysorbate 80. +/- May Contain: Iron Oxides (CI 77492, CI 77491, CI 77499), Mica (CI 77019), Titanium Dioxide (CI 77891), Ferric Ferrocyanide (CI 77510), Blue 1 Lake (CI 42090), Yellow 5 Lake (CI 19140), Carmine (CI 75470), Ultramarines (CI 77007), Chromium Oxide Greens (CI 77288), Chromium Hydroxide Green (CI 77289). Use Dry for a silky smooth application of luminous color. Use Wet for a longer lasting more intense color effect. Deeper tones work beautifully as an eyeliner. I was just fascinated to see its color and was really eager to find it. The shade really has the ability to make one crazy. Baked products always attracted me so this time I decided to give it a try. It comes in a round pan packaging with a transparent lid. Inside the pan we find the baked shadow with a dual ended applicator/brush which is not impressive at all. The bristles of the brush are not soft and the tip of sponge is also not very thick and smooth. There is no mirror provided with the pan so I can't call the packaging very impressive. But if I ignore these things, it's a cute packaging and very light weight for carrying out.The lid is also tight and secure. The texture is extremely soft and smooth like butter. It spreads on the lids like a dream. I didn't find much fall fall out during application, very little which can be manage very easily. It does apply smoother and more evenly when applied wet than dry but I love to apply it dry. 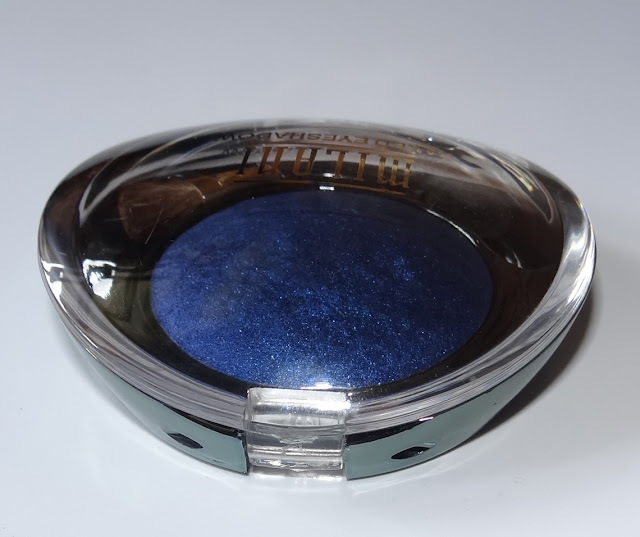 I was not sure about its pigmentation because I have found that many baked eye shadows are not much pigmented but after touching this one all my doubts were cleared. 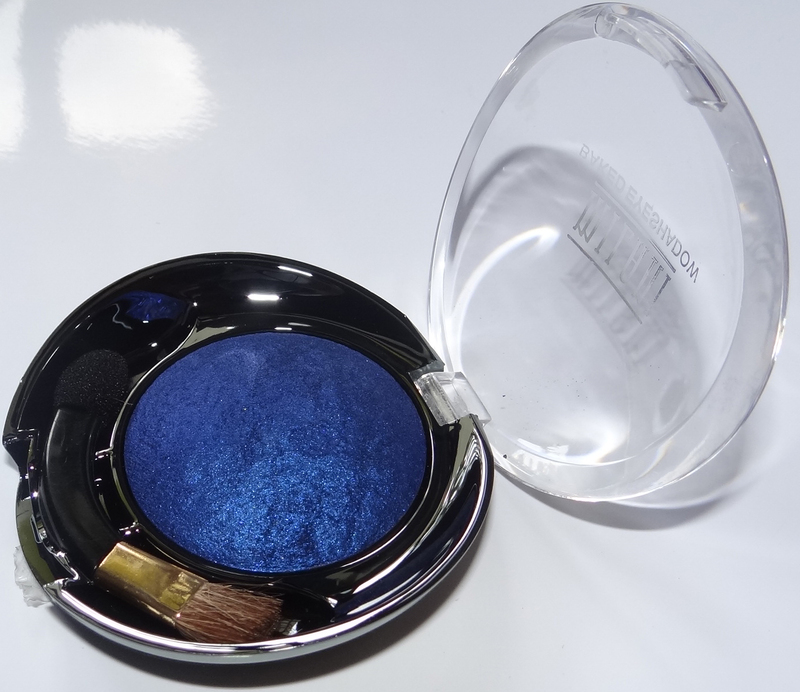 it's highly pigmented & even one touch with your finger proves it intensity. You can apply it in wet form also for more intensity. I found it perfect in both ways either dry or wet. You can use it in many ways. 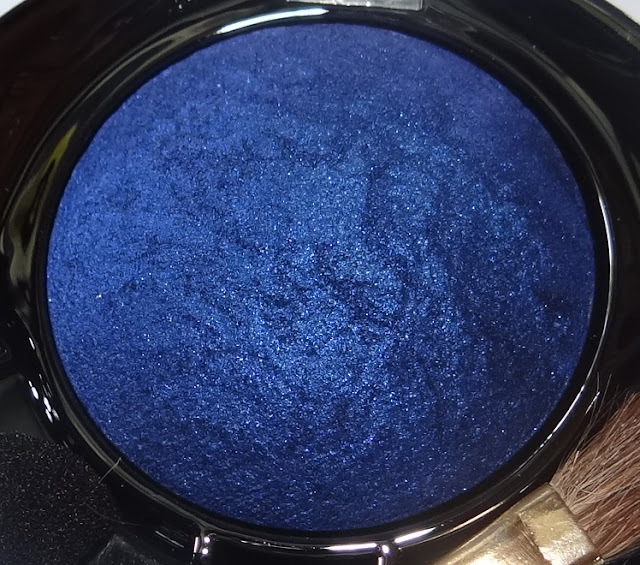 At first I applied it with a black combination eyeshadow and found it beautiful. 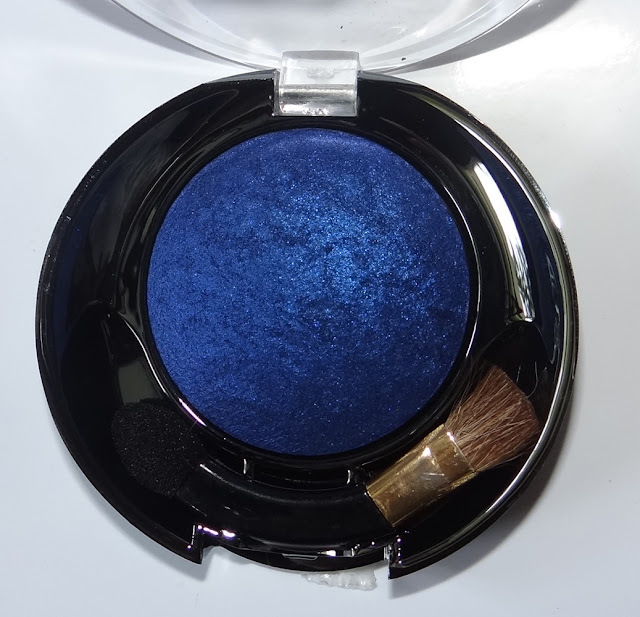 You can apply it alone all over the lids and with other other eye shadows too. In wet form you can use it as an eyeliner which looks very pretty. Excellent!! I can say just one word after using it. It gives really an amazing effect to your eyes. 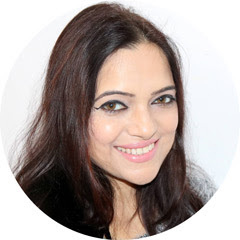 I love to apply it as an eyeliner in day time and a full application on night occasion. It has quite strong lasting power. I applied it for 3 to 4 hours but on seeing its intensity after 4 hours I can say that it can last for 5 to 6 hours very easily with out fading. Cute secure packaging which is travel friendly too. The texture is buttery soft and smooth. There is no much fall out. Can be used as dry or wet, and you find it perfect in both forms. It apply very smoothly on the lids. Gives amazing effect in many ways. The packaging is not very impressive. Finally I love Milani Baked Metallic Eyeshadow Blue My Mind. The shadow has everything which I had expected from it. It's a high quality product from Milani. I would love to try out other shades from this collection, I'm eager to try some other products from this brand too. It can be purchased very easily from BeautyJoint. They ship world wide and you get your things very quickly and in a very secure and safe condition.